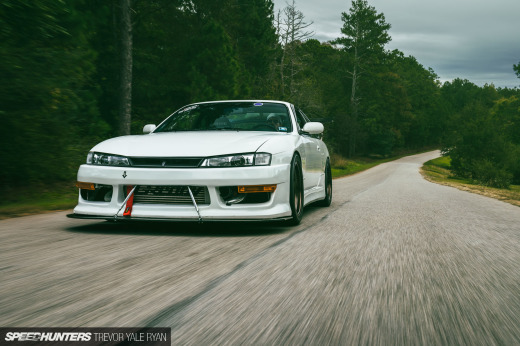 At some point way back in the mid 1990s, Steve Pham’s S14 left a Nissan factory in Japan. Who knows what kind of life its lived since, but here it is in 2016 still kicking strong – albeit with a heart transplant, a face transplant, new legs and countless other modifications and improvements. Today it’s a car that has so little in common with a stock S14 that you almost hesitate to call it one. 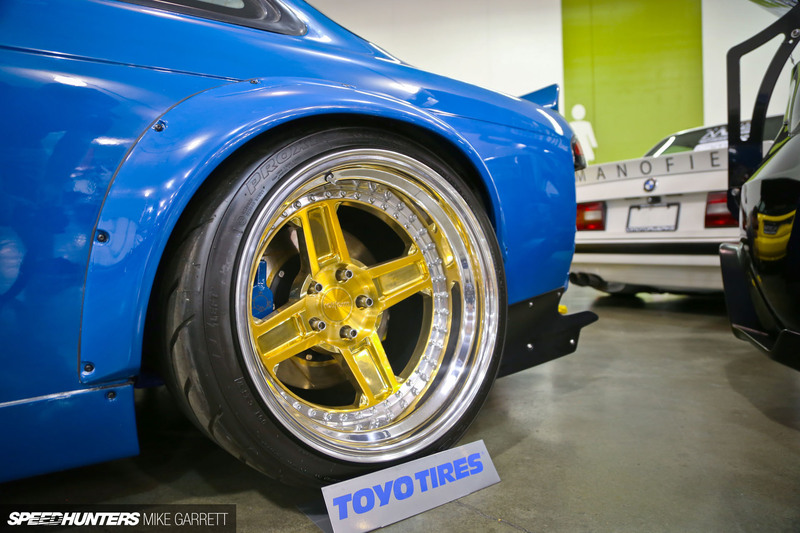 It was also one of the most impressive builds on display at Wekfest San Jose last weekend. 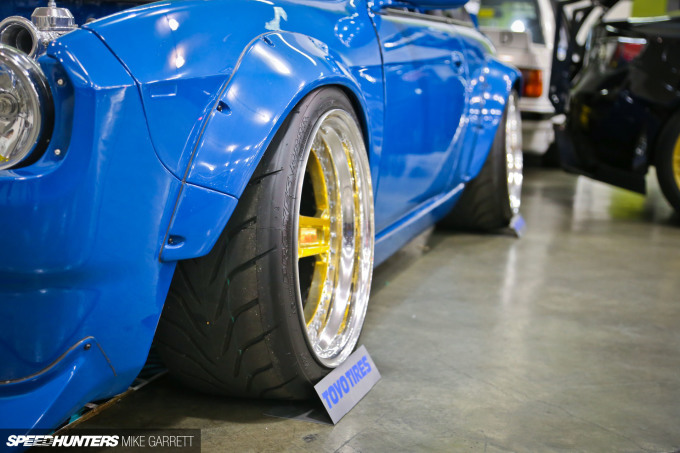 Let’s start with the exterior, which is where you’ll find one of Rocket Bunny’s Boss front end conversions. This alone is something that will throw plenty of folks off about the car’s origins. The S14’s aggressive ride height is achieved with Air Lift Performance suspension, and a big wide set of Toyo R888s are there to fill out the overfenders. The wheels are 18-inch Rotiform RB1s, a wheel that was designed in collaboration with Rocket Bunny with a modern take on the classic four-spoke, multi-piece design. The exterior treatment alone would be enough for most people, but things get much wilder when you look at the engine bay. You won’t find an SR20 here, or a 2JZ or an LS V8. That’s a BMW N54 straight six. 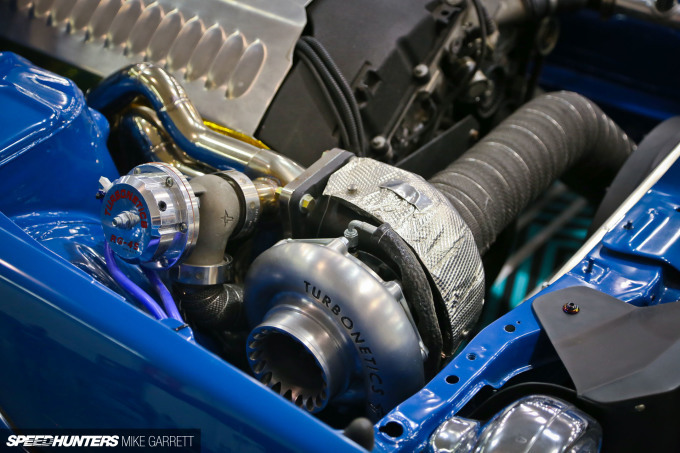 And it’s been souped up quite a bit, with a massive Turbonetics snail being a key part of the package. 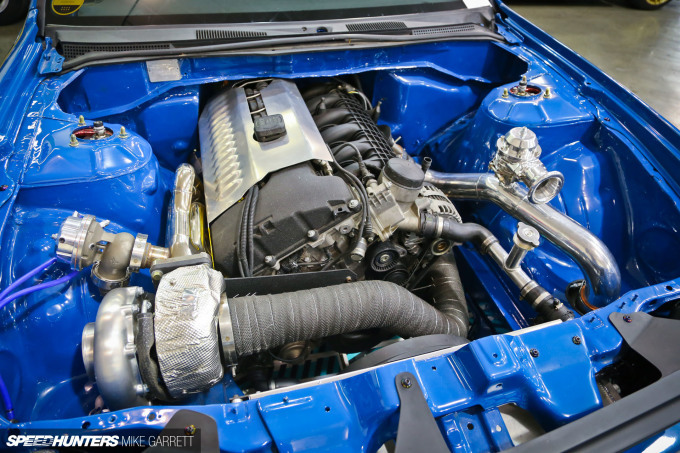 BMW engine swaps into other makes might be popular in Europe, but you really don’t see them much here in the USA, and that makes Steve’s S14 even more unique. Rounding out the package is a semi-stripped interior with a full cage, trick dash setup, and a pair of Sparco bucket seats with a matching steering wheel. I just wonder if the original Nissan designers and builders imagined what their product would look like a couple decades after they made it? Welcome to 21st century hot rodding. Still on the fence with the front end conversion, but the n54 transplant is definitely a unique move. Love those type of overfenders and how they play well with the front end. Been eyeing those BLQ's for my own ride. Sweet post. Seems like every desirable engine is put in too pretty much every car out there what's next, a 69 camaro with a bmw swapped motor? but i'm all for it and this build is fascinating. It does make me wonder if a build like this will remain a show car for the rest of its life or will it be reborn as a track car or maybe a track car..... vip build? only time will tell. I feel like this car sounds on point with the way it looks. No pics of the back? Well I uh, I love the N54, I love the s14, I Like the BOSS kit, but together I uh.. Just can't figure out if I like it all together. Do they make Just the front end of the BOSS kit without the overfenders? I'd love to see what that looks like. Kinda looks like 70's datsuns to me. I like it. Colby O Real riders FTW! The rear bumper removal and front end conversion both shorten the front/rear overhangs very nicely. A matching retro rear conversion would be really cool, and might make it look suggestive of an RX-3 or something like that. 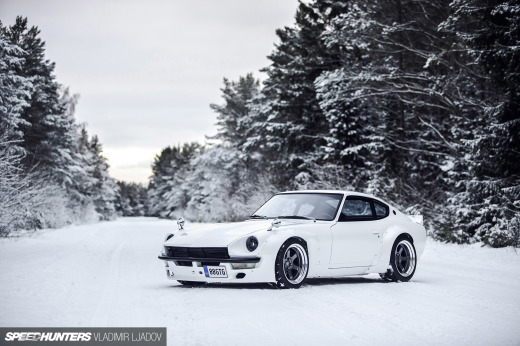 I'm wondering if the RHD conversion was necessary for the engine swap because I see a lot more str8 6's getting dropped into 240's as this becomes more popular! Okay someone tell me..what old school Japanese wheels those are based off of? I can't think of the name for the life of me..
like Brenda responded I'm shocked that a stay at home mom able to earn $7047 in one month on the computer. Not having a cracked dashboard is impressive enough for me lol my s14 dash is all cracked up. nice build. NO CLOSE UP PICS OF THOES SWEET GUAGES?!? Love the N54 swap, very cool. As you astutely noted Mike, BMW M/S motors are to Scandinavia what the 2JZ is to us here in the States, and rightfully so. There are more than a few local guys making big power on simple M50s with just an MLS headgasket and ARP studs. Even the SOHC M20/M30 set-ups make jam! 335i power... must feel good. @TOM Looks like they used the BMW gauges to me. Possibly used the entire BMW dash while they were at it. What about e30 at the back? I definitely have made the declaration of my love for that Boss kit official, though I do wish he had done something for the tail lights and bumper instead of a simple delete for the package.